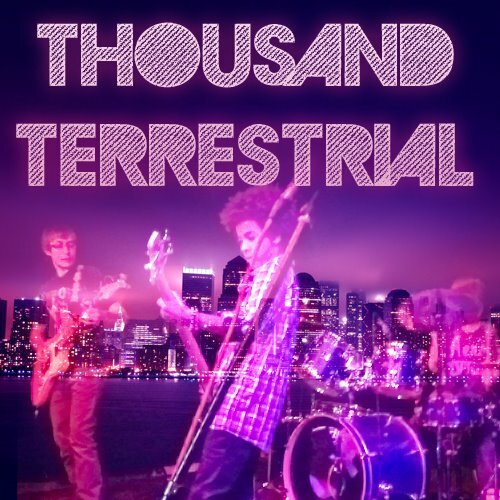 Hard Rock, Alt/Indie, Metal band ‘Thousand Terrestrial’ started out as a ‘Soft Rock’ / Acoustic band called ‘Radioactive’ in their home town of Epsom.Their third gig was also the first gig to be played as ‘Thousand Terrestrial’ – it was at Nescot Live. The trio have recently been recording their debut album ‘Blue Rose’ and their songs have been featured on local radio stations. They write all their own songs and are keen to get gigs in Surrey and London. I was lucky enough to get a chance to chat to Jamie (lead guitar & lead vocals ) about what it’s like to be a musician in Surrey right now, and what it’s like living & playing in Epsom. WAS YOUR SCHOOL IN EPSOM SUPPORTIVE OF YOUR PROJECT? Nescot was definitely one of our best gigs & one of our fond memories. It was our first proper gig… by that I mean we had a light show a P.A and a paying audience. The crowd were great … we didn’t expect too much since we were only the opening band but halfway during our set we got a few mosh pits which was very encouraging! DO YOU HAVE ANY SURREY MUSICAL HEROES ? For me, the Surrey hero has to be Jimmy Page since he is an inspirational guitarist in one of the most legendary rock bands in history. Also, back in the early 1960’s when he was a teenager, he played a few gigs at the church hall where we played our second gig! HAVE YOU SEEN ANY GREAT BANDS PLAY NESCOT? Unfortunately we never got a chance to go back to Nescot since it closed down soon after we played there – however we have seen a lot of great bands going to shows, our stand out favourite unsigned act would be [Eastbourne band] City Of Ashes … they were amazing live and really nice guys. We played with them for the first time in March and again in September – but we have been to see them twice. All of these shows were at venues in Guildford. IF YOU WANTED TO SEE YOUR FAVOURITE BANDS – HOW FAR WOULD YOU HAVE TO TRAVEL? The furthest we have been to see a gig is Wembley Arena to see Alter Bridge, Shinedown and Halestorm which was fantastic. They are all a massive influences on us. It was our first great first big rock show! HAVE YOU USED ANY LOCAL STUDIO FACILITIES TO RECORD? We have been using the Linton Youth Centre in Epsom (formerly Skyline Studios) to record our debut E.P which should be out in February 2014. It has been an exciting process and we have enjoyed recording so much. During the process we learnt how to do all the engineering – thanks to marvellous teaching at the studio – by the engineer there. TO SUM UP – DO YOU THINK THAT EPSOM IS A GOOD PLACE FOR A BAND TO BE BASED ? I think Epsom is an OK place to be based, neither good nor bad. There are a lot of bands from Epsom simply because of realistic rock but I’d like it to be known we are not a Realistic Rock band. We formed naturally and out of our own accord not being put in a room with other random musicians. The problem with Epsom is the lack of any good music venue for teens or adults generally. For Epsom to improve its facilities for bands there needs to be a dedicated “all ages” venue doing gigs all weekend and booking local bands and touring acts.